“Once again, I must ask you to remember that the Marleys were dead, and decaying in their graves. 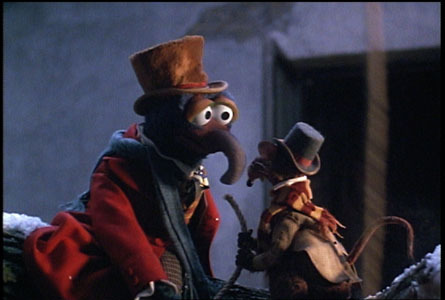 Our mutual love for The Muppet Christmas Carol greatly contributed to Greg and me getting married. This great line – whispered by Gonzo for dramatic emphasis – seems especially appropriate for the grander narrative of Christmas. The Bible tells us that we are born spiritually dead. We, like the Marleys, are decaying in spiritual graves. In a strange sort of image, we, corpses, often try to “fix” our spiritual problem in any number of ways. But the attempts are as absurd as a corpse putting on perfume! The corpse is dead, and perfume cannot do anything about that fact. When we really get down to it, I think the heart of the matter is this: we squirm at the fact that, in our dead state, we need God. We hate the dependence. We think a “good God” would have made creatures that didn’t need to be saved – that didn’t need Him. Oh, the pride!! Oh, the haughtiness!!! Let us humble ourselves and see the truth: rather than puzzling over why we are born spiritually dead, let us recognize that God. could. have. left. us. that. way. But He didn’t. He was born a man at Christmas, and died, sinless, at Easter, to make His dear ones alive. May we exclaim with the reformed Ebeneezer Scrooge: “Oh Jacob Marley, Heaven, and the Christmas Time be praised for this! I say it on my knees, old Jacob; on my knees!” Praise God, who at Christmas became one of us so that we might be made alive!